Enjoying Life With 4 Kids: "The Military Wife"
Waiting for him to come home for dinner…AGAIN! handle the yard work, fix a noisy toilet, bury the family pet. She can file the taxes, sell a house, buy a car, or set up a move……..
all with ONE Power of Attorney. She reinvents her career with every PCS. Locates a house in the desert, the Arctic, o r the deep south. 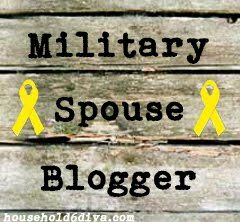 Military wives are somewhat hasty; they leap into: decorating, leadership, volunteering, career alternatives, churches, and friendships. And she goes. She packs. She moves. She follows. Why? What for? How come?